As predicted in our last report in November, La Nina effect has created excessive rains in Europe, delaying sugar beet planting and created dryness in Brazil which is starting to affect sugar cane development. Sugar prices in late April traded at 10.69 c/lb compared with 14 c/lb in November, 17 c/lb in May 2017 and 20.5 c/lb in November 2016. Contributing factors to the falling sugar prices are a result of a global surplus, falling Brazilian ethanol prices, a weaker Brazilian currency and a realisation of bigger crops in both India and Thailand. With a record Indian 2017/18 crop producing 31.2 mln tonnes of sugar, with further increases predicted for the 18/19 crop, Indian exports will continue to flow (with or without a subsidy) to prevent lower domestic prices, leading to cane arrears and the potential for angry farmers in a government election year. With the potential flood of Indian sugar onto the world market, many producers are yet to announce their prices, adding to a more bearish market. Tereos director of their Brazilian unit, Jacyr Costa Filhohas quoted Reuters saying that 90% of the world’s sugar producers are producing below the cost of production at today’s current prices and that traded prices would need to increase to 15-16 c/lb for Brazilian mills to be reasonably profitable. Global sugarcane production for 2017/18 peaked at 155.6 mln tonnes, compared to the previous record in 13/14 of 146.3 mln tonnes. 2018/19 sugarcane production may fall back to 152 mln tonnes as a result of the expected fall in Brazilian output. Global sugar production for 18/19 is estimated to fall by 4.9 mln tonnes to 196.2 mln tonnes, but would remain the second largest ever after 2017/18 record production of 201.1 mln tonnes. The beet producing areas of Europe have experienced increased rainfall which delayed planting in March, but improved weather in April saw most of the beets sown. The subsequent high temperatures in May has allowed for rapid beet development which may offset the late start. Early estimates for the 2018/19 crop is for the EU to produce 20 mln tonnes of beet sugar. Future EU beet yields from the 19/20 crop onwards may be threatened as a result of a change in policy over the use of Neonicotinoids, a widely used insecticide, which are used to protect the crop against pests. Farmers have indicated that crop yields could drop by 12% across the EU, with the potential of a 50% decrease in ocean climate zones. Greenpeace EU food policy director has stated that yields of Rapeseed have not declined since the ban for the crop in 2013. As we come to the end of the half way stage in the first post-quota season, total white sugar exports for the first six months of the 2017/18 crop has been 1.820 mln tonnes. The EU exported 1.328 mln tonnes of white sugar in 16/17 with the commission predicting exports to rise to 2.8 mln tonnes in 17/18. This compares with total sugar imports into the EU for the first six months at 662,000 tonnes, compared with 1.140 mln tonnes a year ago. Russia and the Ukraine experienced the same cold and wet weather as the EU countries in March, delaying beet sowing, with Russia only managing to plant 39% of their target area by the end of April. Ukraine managed to plant 84% of the targeted area by the end of April, with an estimated 5% reduction in planted area for the 2018/19 crop. Harvesting of the 2018/19 cane crop began in late April. The dry weather has allowed millers to crush at a high pace, but the dry conditions could slow the cane development. This is of major concern as the dry season is yet to come. With soil moisture much lower than average, this could damage the canes that are scheduled to be harvested later in the crop at the year end. Despite the recent drop in hydrous prices, fuel remains more profitable to millers than sugar. The latest estimate for the 18/19 sugar production is 31 mln tonnes, which is 5 mln tonnes less than in 17/18. This reduction will reflect in lower export availability in an already oversupplied world market. The sugar mills are currently incentivised to produce for the strong ethanol market, compared to the oversupplied sugar market, but with Brazilian election this year, the Brazilian currency may decide where millers will sell their product. Harvesting the tail of the 2017/18 cane crop which began in late November will continue into May. Ideal growing conditions in 2017 has resulted in a record crop after two years of drought, with estimates at 14.3 mln tonne of sugar, compared to 10.2 mln tonnes in 16/17. The rainy season has just begun, receiving above normal levels. Good rains now will benefit cane yields for the next crop in 18/19. Sugar production has focused on raws rather than whites, due to the limited capacity of the centrifuges and boilers to make white sugar from raws and the local market also serves as an additional outlet for white sugar, allowing raws to be exported. China has also become a declining market for Thai white sugar as a result of high stocks in neighbouring countries and more stringent border controls. The 2017/18 sugar cane crop is estimated to produce 31.2 mln tonnes and with a record cane acreage for 18/19, India is estimated to produce a further 2 mln tonne of sugar over the current crop. A good 2018 monsoon season will determine the country’s future output potential. This has resulted in a downward trend for domestic Indian sugar prices which are now $100/t below world market prices. These lower sugar prices mean that millers are unable to provide cane payments resulting in high cane arrears. The government last Wednesday announced the anticipated cane subsidy to farmers, of 55 INR/t in the form of direct payments, this subsidy will aid the mills by clearing a portion of cane arrears owed to the farmers, which will encourage mills to export the allocated quota of 2 mln tonnes. South Africa which has suffered droughts since 2014/15, saw sugar production fall to only 1.6 mln tonnes in 16/17. Improved rainfall saw the cane crop recover in 17/18 with sugar production rising to 2.1 mln tonnes. Estimates for the 18/19 crop are similar to last year’s output. In Swaziland good rainfall at the start of the year was critical to cane development and allowed farmers to re-plant cane following the recovery of the 2016 drought. As a result, a 6% rise in production is expected. Cane deliveries to the mills began earlier this month in Zimbabwe, with sugar production expected to increase by more than 22% as a result of land reforms. Growers are experiencing increased output due to irrigation from the recently built Tugwi-Mukosi dam. African cane sugar production in 2017/18 was 9.5 mln tonnes and is expected to rise to 10.2 mln tonnes in 18/19. Harvesting the 2018/19 crop is expected to start in June following a slight delay after the tropical cyclone Iris hit the northern Queensland province. Increasingly farmers are looking at other crops such as rice, due to Australia’s exposure to exporting onto the world market (low global prices) and lack of suitable land that is close to the sugar mills. Cyclones and drought affected the 17/18 crop, although rains later in the year allowed for some recovery, so sugar production finished at 4.7 mln tonnes the same as in the previous season. Estimates for the 2018/19 crop is to produce 5.0 mln tonnes of sugar. The Mexican government has lowered its estimate for the 2017/18 cane crop which is nearing completion to 5.98 mln tonnes, down from earlier predictions of 6.2 mln tonnes. This will not affect exported sugar to the US as the quota of 1.7 mln tonnes will be achieved. Estimates for the 18/19 cane crop are similar to this year due to a stable planted area. The USDA has adjusted its estimate for the total sugar production of the 2017/18 cane and beet crops at 9.14 mln tonnes. The first projection for the 18/19 crop will be released later this month, with total sown sugar beet area about 2% lower compared to this time last year due to cold and wet conditions, although phenomenal progress with planting has occurred in the last two weeks. However, the lateness leaves the beets vulnerable to drought stress through the summer months. Sugarcane production is estimated to hardly change for 2018/19 at 3.6 mln tonnes. The government is expecting an increase in sugar production to 10.6 mln tonnes, an increase of 4.2%, as a result of increased planted area for the 17/18 crop. Beet sugar production increased 56% over the last three seasons and reached 1.3 mln tonnes in 2017/18. There has been much investment in cultivation, mechanisation and new modern factories being built to help boost production. This could outweigh the increase in consumption as the demand for high fructose corn syrup remains strong. 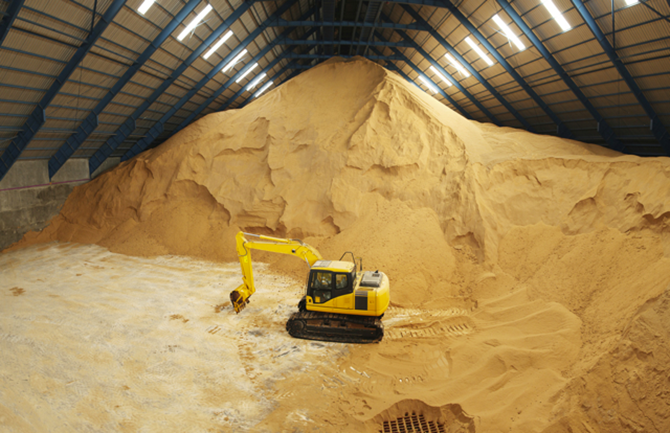 China is expected to import 3.2 mln tonnes of sugar, a slight increase over the 2.29 mln tonnes imported in 16/17.